15th June 2006 - Lena launched at last ! Actually my late Mother's birthday, bless her. There was no crowd gathered to see her in - and with the prospect of manouvering her around and into a tight berth next to a rather shiny 28,000 pound price tag motor cruiser, on my own - she seemed the size of the Titanic to me that morning ! Anyway, all went well, the engine started - and thankfully another boatowner who happened to be up early, wandered round onto the poontoon to give me some reassuring 'parking instructions'. I was quite proud though - I took her in there nicely. Just pure andrenalin probably - I even sussed out she had touched bottom halfway in - so waited for the top of the tide a while just to pull her along. A great feeling after all this time - and floating spot on to my water line, just about 15mm under the boot top.See Pic. My concern though was that there seemed to be a little more water in the engine bilge than prior to launch. The packing gland did not seem to be leaking - so before I left that day ( England match! ) I dried the bilge out very thoroughly. She would go over two tides before I came back, so I could see if there was any seepage. Returned that afternoon - HW 23.25 that night. Very happy to see bilge still bone dry. Mooring warps ok. That evening, staying aboard had a chance to fiddle with the Raymarine depth and sea toilet. The Raymarine was spot on - but only seems to register at 0.5 m.This seems quite consistent, always it kicks in at 0.5. I set an offset of +0.4. which seemed about right for water line. I made up a bit of a lead line when it was showing 1.2 m - sure enough a quick plumb around in various spots showed it to be very accurate - especially on such a small depth and soft mud. Very pleased on that one. Only a 10.7 m tide at Uphill - so she was just going to get off around HW at 11.45. This mooring is just a temp affair until I either go on to my river mooring on the Axe, or can move her to another pontoon a few metres lower on the mud ! for a little better access. Its not that you cant get down the river - once immediately off the pontoon berth I'm in deeper water. I just dont have any leeway to get back on the same tide, unless there is about 12 to 13 m at Uphill. Until I sort out the engine is running fine - and gain a little confidence, I dont want to take her out into the bay and have to stay out until the next HW. Outboard bracket spring latch is still jamming - I coated the spring up with 'Lancote' lanolin, which is fine for stopping corrosion but useless as a grease as it dries up. So have to take that off and strip it probably - or might bite the bullet, admit defeat on this one and buy a new one ! Ran the engine at HW - with a mind to charge batteries. Immediately spot my leak - water appearing from under the engine - worrying, for a moment or two. A closer look isolated it to the base of the water pump. Checked hose connections - definitely pump. So off with the pump - I've had it off before - its easier to take the pump housing off completely for fitting a new impellor. I could blow through the intake with the oulet blocked ! Although its a bit of a pricey item - but under 200 I think - I'm more than happy it was coming from there, rather than some part of the engine. I stripped it - it was only one circlip at the rear - then the bearing assembly and shaft slides out. The front seal was shot and the shaft where it runs in the front seal was in about the worst condition imaginable - I've don't know how it could get that worn from running in a rubber seal ! Deeply scored - Monday will reveal how many pound notes and how long on order. I had actually done quite a bit of work to this pump on the impellor end and the rest 'looked ' ok.
( got one from Rollo UK in two days - 156.00 plus vat, plus, being Yanmar, 1.80 for the rubber base seal O ring ! ) Quality part though - cast bronze and at least it did come with a new impellor. With the boat afloat also had the chance to try to check the mast for upright. 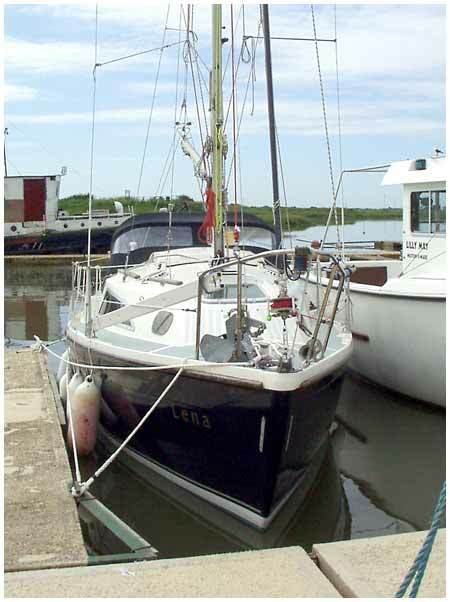 With a bit of jiggling and my old shoe last as a weight from the halyard, I quickly realised it was useless to stand by the mast to check the plumb line, when I should be in the cockpit. A second try on Sunday with an extra body roped in to help - and it would seem with two in the cockpit area, the mast head is aft of the foot by about 70 mm at the boom, which equates to about 1/2 degree rake, according to my very expensive little book on 'rig tuning'. Also, my forward flexi water tank is more than half full, so thats about 180 lbs. All in all I settled for how it is - In fact I've pulled the stemhead rigging screw in by about 12 mm.That gives me enough adjustment on the backstay bridles to to get the Loos gauge to max on the backstay upper wire. To lengthen the forestay any more would have meant having to shorten the backstay with a swageless fitting. Very low neaps now for a few days - may take the opportunity to take a trip down to my mooring in the wetline and check out the outboard. For the brief time its actually been afloat - Lena seems remarkably stable. In the cabin, you really have to leap around a bit to convince yourself she is afloat - and just moving up the side deck really makes very little difference to the trim. Looking forward to the first trip down the river - maybe to my Axe mooring and back over two tides - then out for a day in open sea.